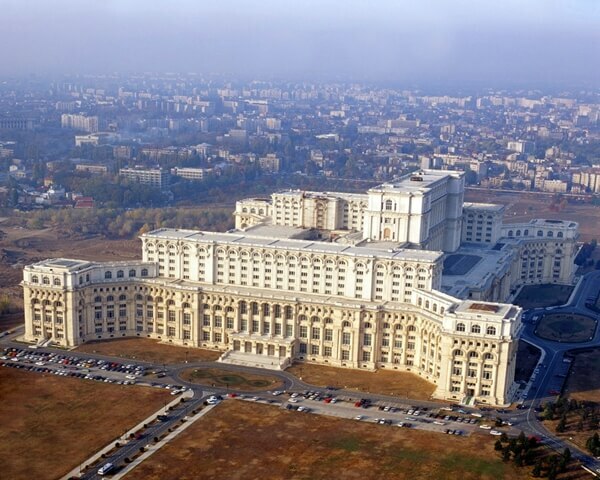 People House today called The Parliament Palace is one of the most beautiful architectural design in Bucharest, Romania. It measures 270 m by 240 m, 86 m high and 92 m below ground, it has 12 levels, and holds of World Records. It is the second largest building in the world next to the Pentagon building in the United States. This building can be viewed form any corner of the city; its magnificent architecture is unique in the world. People House has started to be built in the communist period and finished in 1997 after 7 years of democracy freedom (in December 1989 the communist regime fall of). the main materials used for this giant architecture design were: stone, wood and marble. The interior designs also beautiful the hall that it has a big lobby with carved marble columns, linked to the monumental stair, above the stairs there is a dome made of blue glass and there is also a chandelier. On the exterior site there are big windows with frames made by wooden sculptures. Also there are many rooms called by the names of the historical personalities and fore example the I.C. Bratianu room which it was called initially The Provinces Hally it is formed of a central area with a 42 m opening separated from the side spaces by a succession of free columns, covered with marble it is the brightness of all in my opinion and is so exceptional, by the lamps and brackets imitating the chandeliers of the epoch. whoah this blog is magnificent i love reading your articles. Keep up the good work! You know, a lot of people are looking around for this information, you can help them greatly. I think this web site contains some really superb information for everyone :D. “A friend might well be reckoned the masterpiece of nature.” by Ralph Waldo Emerson. I told my kids we’d play after I found what I nedede. Damnit. The modern offices need to pay more attention to office interiors since most people today spend maximum time of their lives in office. The furniture selected should be ergonomic and the interiors should be managed to avoid clutter. Thank you for sharing this blog alongwith the lovely pictures. Great share!